The Village and the Chamber of Commerce host an annual Tree Lighting Ceremony at 5:00 p.m. on the first Sunday in December in front of the Village Hall. 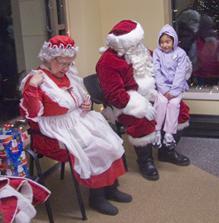 The event features Santa Claus, musical performances by area school children and free refreshments. In 2011, the event was expanded to include a new Festival of Trees. In addition to the Tree Lighting Ceremony, the Village Hall was filled with decorated trees provided by local businesses! The event was such a success that it has become a new annual tradition. Residents are invited to bring the whole family to meet Santa, have cookies and cocoa and vote for their favorite tree. For those unable to attend the Sunday event, the Festival of Trees will stay up for the following two weeks in December for viewing during business hours. For more information, or if you are a business interested in putting up a tree, please call (630) 896-8080 ext. 9003.